This Dairy Free Gluten Free Coconut Layer Cake is a stunning spring dessert. 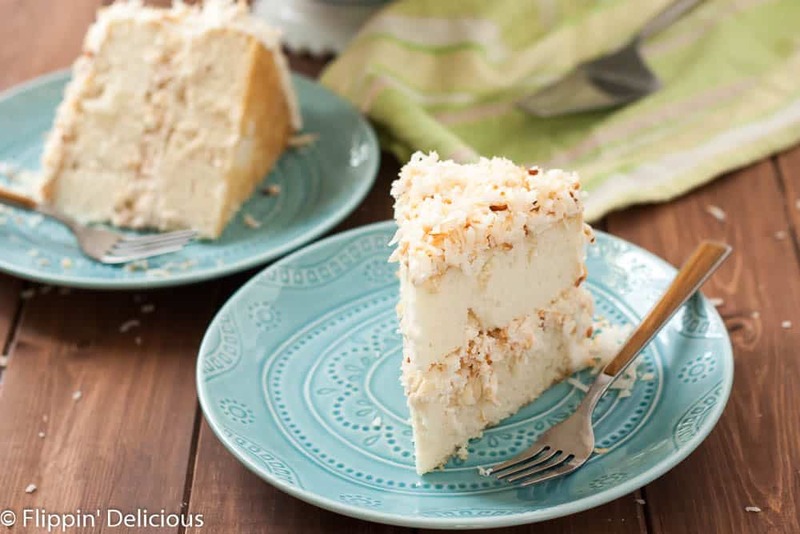 The toasted coconut sprinkled all over the silky dairy free coconut buttercream hides any imperfections making this is an easy, show-stopping dessert for Easter. This post is Sponsored by Glutino and Earth Balance. As always, all opinions are entirely my own. 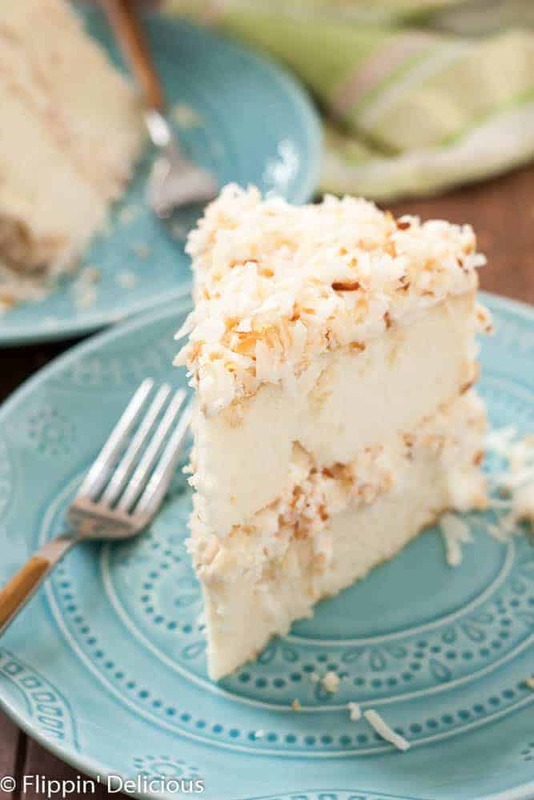 Coconut Layer cake is a classic, especially in the spring. I actually planned to make a dairy free gluten free coconut layer cake before Easter last year. And the year before that. A layer cake can seem like a daunting and difficult dessert. Last year starting one just took more energy that I had because I had a 5 month old and my house was on the market. The year before I was still in the midst of morning sickness so baking a gluten free coconut layer cake was not in the cards. But that was because I was planning to make a gluten free coconut layer cake completely from scratch. You (and I) don’t need to make everything from scratch! Especially during any holiday season. There is already enough going on. Baking all of the holiday classics from scratch takes time away from the holiday that you could be enjoying with your family and loved ones. 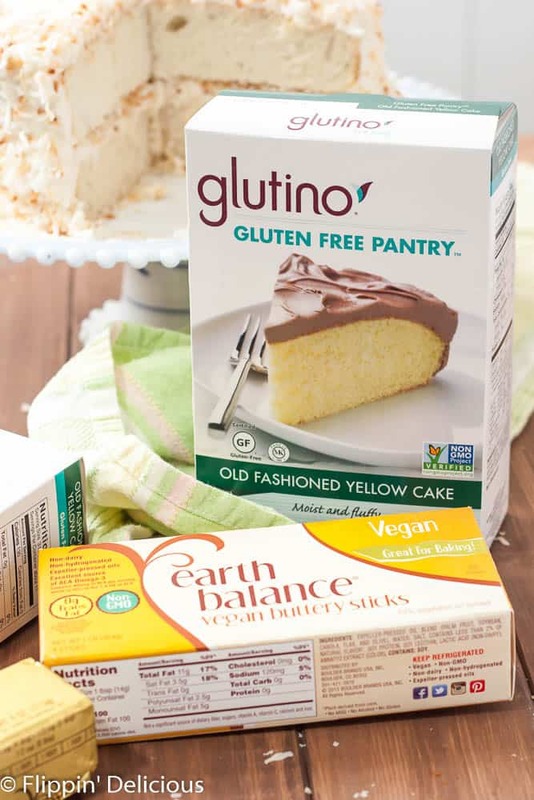 That is why holidays are one of my FAVORITE times to use some shortcuts- like using Glutino’s Old Fashioned Yellow Cake Mix– to make this stunning gluten free coconut layer cake. I made just a few tweaks to the instructions on the back of the box to make a white cake (instead of a yellow cake) and to add several different layers of coconut flavor. This is no “white-cake-with-coconut-frosting.” It is a dairy free gluten free coconut layer cake, with coconut all the way throughout it. Did you catch my recipe for Homemade Coconut Extract? The whole reason I made Homemade Coconut Extract is because I wanted to really pump up the coconut extract in this dairy free gluten free coconut layer cake. The homemade coconut extract does just that! Obviously, you can substitute a store-bought coconut extract if you’d like. Making the coconut extract only takes a few minutes of prep, but you have to start it at least a few days before you plan on baking your cake. I also used full-fat coconut milk in the frosting and in the cake. I refrigerated my coconut milk to separate the creamy solids to use for the frosting and then I used the remaining liquid for the cake. Using Glutino’s Yellow Cake Mix, baking the cake layers was quick and easy. The frosting was pretty simple to make too. I just whipped up 2 Earth Balance Vegan Buttery Sticks (to keep it dairy free) with the creamy solids from the coconut milk. Then I added powdered sugar and some of my homemade coconut extract and whipped it up some more. The coconut cream, or whatever you call it, made the frosting silky smooth. It is so light and creamy, and not overly sweet or rich. It really is something else! If you don’t want to go to the extra effort of separating a can of coconut milk just use the dairy-free option for my easy American buttercream, using Earth Balance, and then add some coconut extract. The last secret to the ease of this cake is covering the entire dairy free gluten free coconut layer cake in toasted coconut. 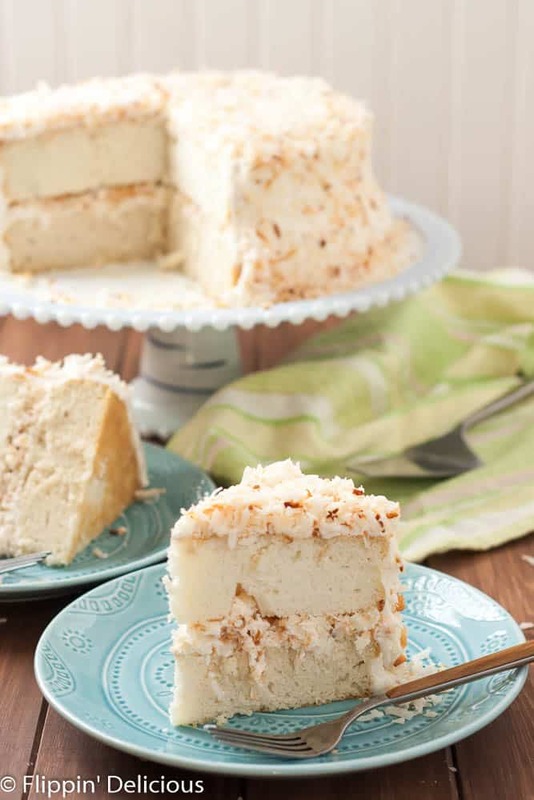 It hides any and all cake layering imperfections in its fluffy coconut goodness making this dairy free gluten free coconut layer cake look impressive. This dairy free gluten free coconut layer cake is sure to be the center of attention during your Easter dinner. The shortcuts will be our little secret😉. If you are looking for more coconut-covered treats I think you’ll love my friend Nicole’s (Allergylicious) Blueberry Lemon Snack Cake. It is covered with coconut, no icing required. Preheat the oven to 350F. Line 2 9inch round cake pans with a parchment paper circle and lightly grease OR lightly grease and dust with gluten-free flour. In a bowl, whisk together all of the cake batter ingredients until smooth. Divide evenly between the 2 pans and bake until a toothpick comes out clean, 25-28 minutes. Let cool before removing from the pans. In a stand mixer, or using a heavy-duty hand mixer, whip the Earth Balance Vegan Buttery Sticks and the coconut milk solids for approx 5 minutes. It should become fluffy and smooth. If it isn't there yet, just keep whipping. Mine tend to look curdled at first. Add about half the powdered sugar and the coconut extract, and whip until smooth. Gradually add more powdered sugar until you have a smooth, spreadable, and not runny frosting. I used the whole bag, but you might need less depending on how much liquid was left in your coconut solids. Preheat the oven to 325F. Spread the shredded coconut evenly on a baking sheet. Bake, stirring every 2 minutes for 5-10 minutes or until it is beautifully toasted. It will toast quickly, so keep a close eye on it. Carefully trim any dome off of the top of each cake layer using a serrated knife. Spread a layer of frosting on the top, sprinkle with toasted coconut (optional) and then center the second cake layer on top. Spread the rest of the cake with an even layer of frosting. 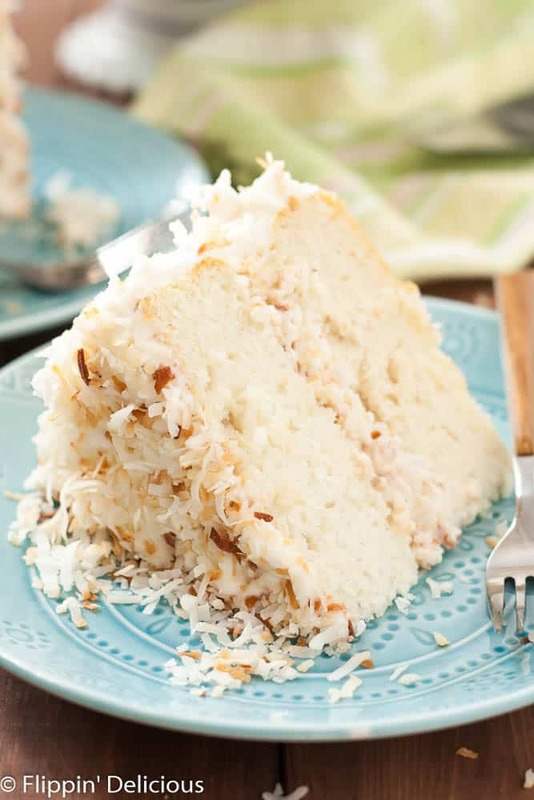 Sprinkle and gently press toasted (or untoasted) coconut all over the cake. If you used wax paper strips, gently pull them away from the cake before serving. Before making the cake or frosting chill a full fat can of coconut milk overnight in the fridge. Open it and then carefully drain off all the liquid, separating the solid coconut cream. I had approx ¾ a cup of solids and 1 cup of liquid, which was exactly what I used in this recipe. If your can of coconut milk has less solids, or a little more, it will be just fine. If you don't have enough liquid, just add enough dairy-free milk to equal 1 cup. You really knocked this one out of the park! Best use for Glutino’s cake mix I’ve seen yet! Thank you Erica! 🙂 Glutino’s cake mix made it so much easier. Wow that is a pretty cake! 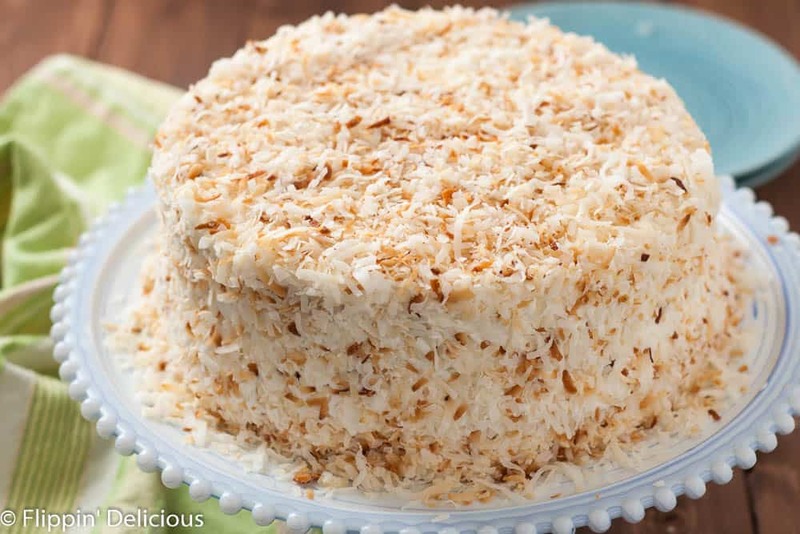 My mom loved coconut cakes, when I see one I always think of her. This is so beautiful Brianna. Thank you Emily! I love recipes that remind us of those we love, and miss. OH, Brianna! That cake looks sensational!! Wow! Thank you Jeanine! It was spectacular, and surprisingly simple to bake. Stunning pics, Brianna! I don’t know how you waited to take a bite though – I want one NOW!!! Thank you Jules! It was so hard to wait. I didn’t wait a second to smear a little frosting on the trimmings from leveling the cake. I knew in an instant that the cake was a winner. Oh my melt in your mouth delicious! This looks awesome! Ohhhh wow, you had me at coconut. This cake was made for me!! The frosting is simply Divine, Lindsey! I think you’ll love it! If I don’t care whether my cake is yellow or white, can I use three whole eggs rather than 6 egg whites? Yes! It should be 4 whole eggs instead of the 6 whites. Hi Brianna, just made the cake for Easter Sunday dessert. It looks beautiful and the bits that I was eating as I was making it were very good. I did buy the full fat coconut milk but after putting it in the fridge for a couple of hours, it didn’t really separate and the whole thing was very creamy so I just measured out 3/4 cup of that. ( I had coconut milk in my fridge that I used for the cake mix). How runny is the frosting supposed to be? Mine was very runny but as as you said, you can hid a lot of imperfections with the coconut. I’m sure that it will be a hit. Thanks! Your frosting was probably runny because the coconut milk didn’t have enough time to separate and harden. Normally I chill my coconut milk overnight. You’ll end up with a very firm and solid coconut cream and watery liquid. Closer to butter in consistency than cream. I am glad that it tasted good, and I hope you enjoyed it. Happy Easter! I made a cupcake version of this for Easter. It was AMAZING! Thank you for the hard work! You are very welcome Tricia! I am so happy that you enjoyed it. Happy Easter! I’m eager to try this recipe, but can you please clarify the 4th sentence in NOTES. It’s gobbledygook on my screen. It starts “If your can of coconut milk has . . .” & then becomes unintelligible. Thank you for any help you can give me. Thanks for letting me know so I can fix it. So many people in my family can’t have any gluten and your cake recipe was a huge treat for them. Thanks for sharing this recipe. You are very welcome Lauren! It brings me so much joy that you and your family enjoyed it so much! I am not sure what changes you’d need to make without experimenting myself with the cake mix. I used all egg whites instead of the yolks because I wanted to keep the cake itself as white as possible. You can use whole eggs if you’d prefer. Then I would suggest subbing coconut milk for any of the liquid (water or milk) that it requires. Hope it turned out ok! Happy Birthday to your mom! Hi! Thanks for your reply. I ended up sticking to your recipe pretty closely. My box mix required the same amount of eggs as the Glutino so I used 6 egg whites. The mix also called for oil (which I used coconut) and water (I used the coconut liquids from a can). It turned out really well! It was amazing, everyone loved it!! The coconut cream can curdle the frosting if it has too much liquid in it. That seems to be a common issue that people have been having. I’m so glad that you and your family enjoyed the cake! Um, this is INCREDIBLE. You are slaying this recipe. And homemade extract? Amazing. Come make this for me please! I don’t think I’m going to have room for any luggage next time I drive through Phoenix. 😉 My entire van will be filled with cakes and cookies. You are going to have to pick your favorites. I would love to try this recipe. I don’t have those cake mixes. Do you know what the recipe would need not using the cake mix? You can substitute your favorite gluten-free cake mix, or use my Homemade Gluten Free Cake Mix. You may need to adjust the amounts of the other ingredients to match the amount of liquid (etc) called for by your cake mix of choice. Hope that helps! Does the cake mix contain many dairy? Since it’s a box cake? 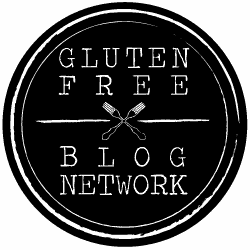 Also my son has egg allergy what can I use instead of egg whites? When I last checked, this cake mix was dairy free. Things can change so I would double check. You can also use another gluten free cake mix. If necessary, adjust the amount of liquid to match what that cake mix calls for. I made this cake years ago with egg replacement (EnerG, I believe) and it was FANTASTIC! I have come back to this recipe and am devastated that it would seem you can’t get Glutino cake mixes anymore. I followed your link to their website and it doesn’t have cake mixes anymore and all I can find in stores are the brownie and corn bread mixes. So, at least for right now, it’s not possible to make your recipe as it is, and I thought you should know. It’s so disappointing because this cake was amazing. I’m wondering if you can recommend a cake mix that would turn out as nicely with your recipe as the Glutino did? I just tried Pamela’s and that was a no-go, at least with enerG it was not good anyway. I’m sad. Thank you for letting me know that Glutino’s cake mixes are no longer available. I’ll update my post and find a replacement. Have you tried my homemade gluten free cake mix? It may work well. Whichever cake mix you use, be sure to use the same amount of liquid (swapping the coconut milk for water or milk) and egg-replacer to equal the number of eggs called for on the box. 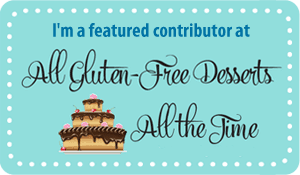 I recently tried Cup 4 Cup gluten free cake mix and it was incredible! I think it would work well in this recipe.